I will save most of the nostalgic reminiscences for another post, but this was a special one: our 50th Cobaya dinner. When we started this little experiment nearly six years ago, I had no idea if we'd get enough people to show up for a single dinner, much less be able to do it 49 more times. So it was particularly appropriate that we got to do Cobaya Five 0 with some people who have been a big part of our story. 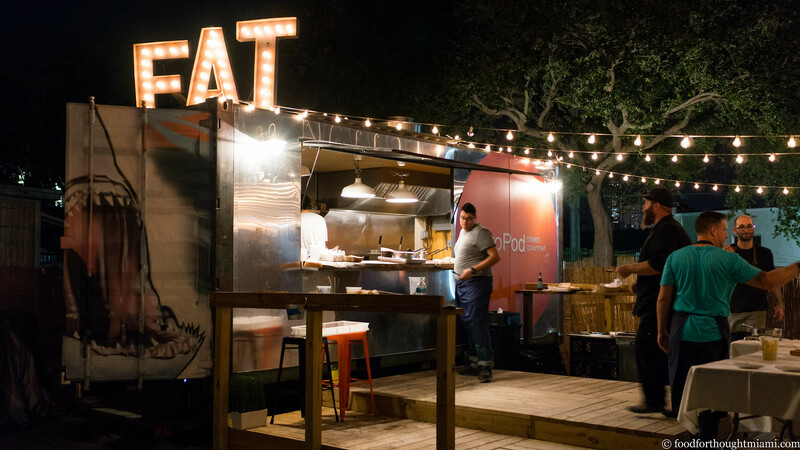 Chef Jeremiah Bullfrog was one of the first people to reach out to us when we started on this endeavor – this was before gastroPod v.1.0, much less v.2.0 in a shipping container in Wynwood (and the new v.2.5 in Aventura Mall). 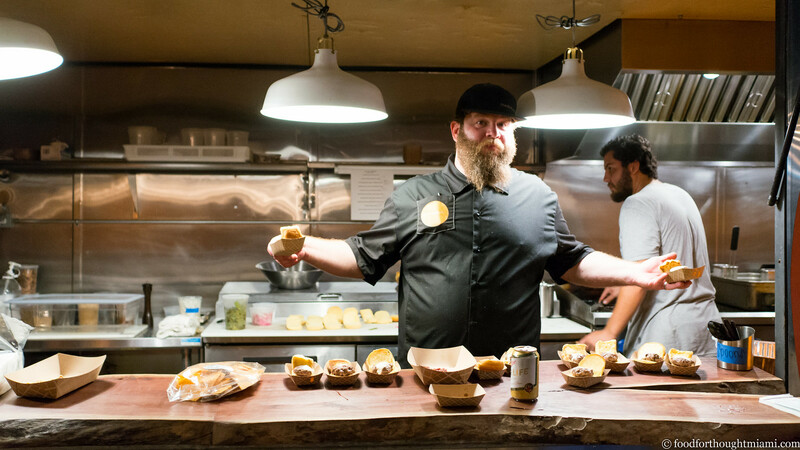 He cooked for Experiment #2, made a return a couple years later for Experiment #19, and has helped out on countless other events. H. Alexander Talbot – one of the co-creators, along with wife Aki Kamozawa, of the Ideas in Food blog, and co-author of "Ideas In Food: Great Recipes and Why They Work" and "Maximum Flavor: Recipes That Will Change the Way You Cook" – has been an inspiration and mentor to many of the chefs with whom we've worked. He was also back for a reunion with us after doing Experiment #10 almost exactly four years ago. And Kurtis Jantz, Executive Chef at the Trump International Beach Resort in Sunny Isles, was really the original inspiration for these dinners. 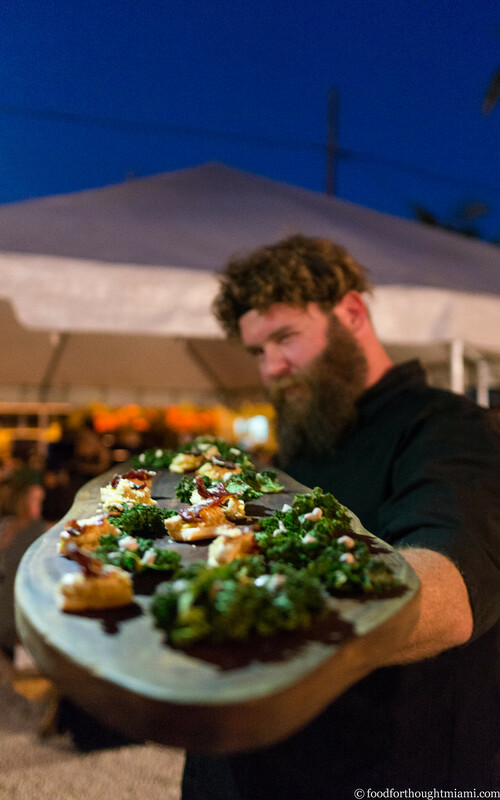 Before there was Cobaya, there were the "Paradigm" dinners that Kurtis and then-sous chef Chad Galiano were doing. It was while waiting in the valet circle at the Trump that the idea for this Cobaya thing was hatched. 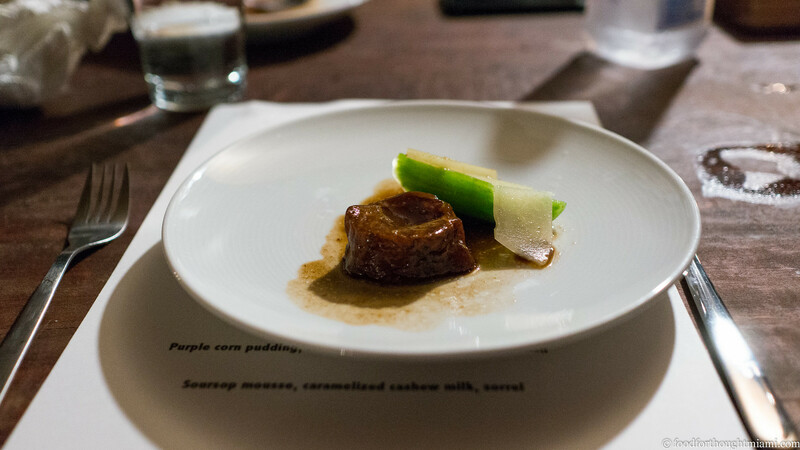 The Cobaya Gras dinner Kurtis and Chad put on remains one of my favorite of any of our events. So it was great to have him churning out the snacks for #50. Another guy who was at Chef Jeremiah's Experiment #2: Steve Santana. Back then, he was a coder who had convinced his firm to play host to one of our dinners in a penthouse office in Midtown. Now he's the chef at Taquiza, a great taqueria in South Beach, and has also had a backstage hand in many of our events. I was really touched to hear in an interview on ChatChow.com that he credits that Cobaya dinner with steering him toward a career in the kitchen. But I said I would save the trip down memory lane for another post, so let's talk about this dinner, because it was a great one. (You can see all my pictures in this Cobaya Five 0 flickr set). We started with "a small procession of snacks and such" supplied by Kurtis Jantz, which made me miss those Paradigm days. Cajun spiced crispy kale dotted with a vegan pecan aioli. Chicken liver "preparada," the mousse layered like a Cuban sandwich on pressed pan Cubano with toasted cheese, crispy pata negra ham and mango mostarda. 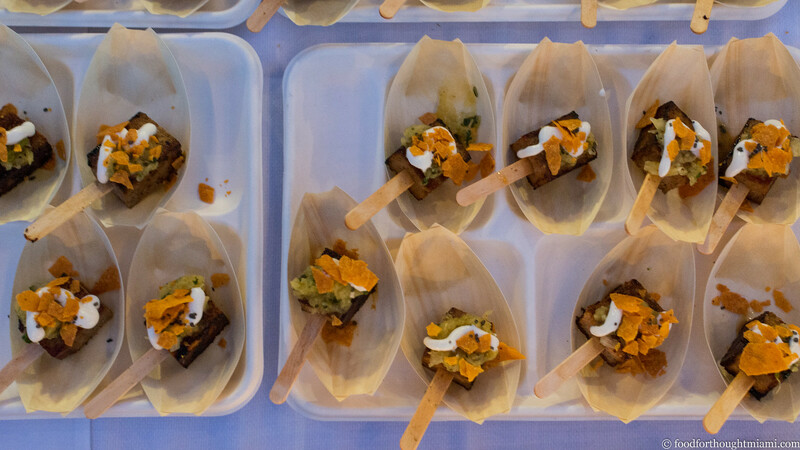 Pork on a popsicle stick with charred pineapple salsa, queso fresco crema and crisp sweet potato chips. 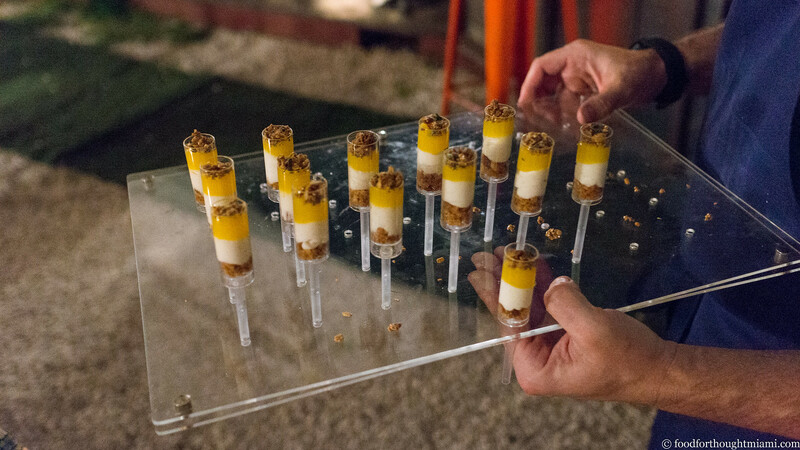 Push-pop "creamsicles" with orange gel, whipped goat cheese, macadamia nuts, and an oregano spiced ancient grains granola. A hogfish crudo dressed with sour orange, aji oil, black lava salt and cilantro. 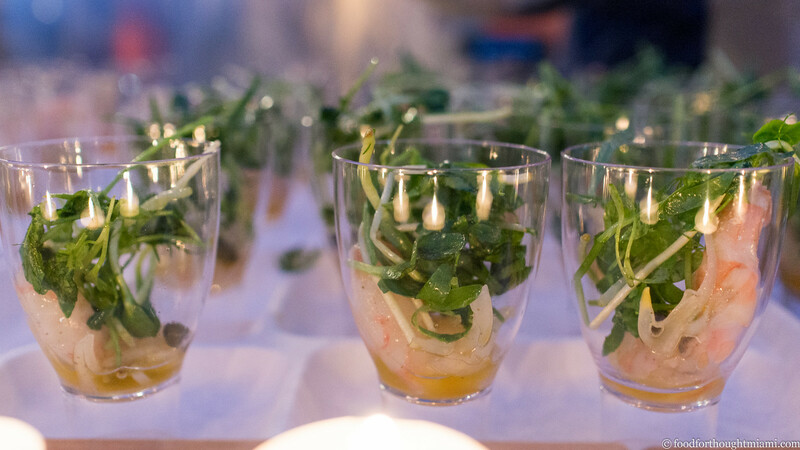 And a tug on the heartstrings for me: "Frod's Mom's" pickled shrimp, with a salad of shoots and herbs. I called this "South by South Florida:" chicken fried shrimp (Key West pinks, I'm guessing), served with a schmaltz mayo and roasted lemon. Simple. Delicious. The sweet shrimp had just a whisper of crispy flour coating, fried just enough that you could crunch them shells and all. The chicken fat enriched mayo was rich and smooth like Jay Z. I could have eaten a bucket of these. 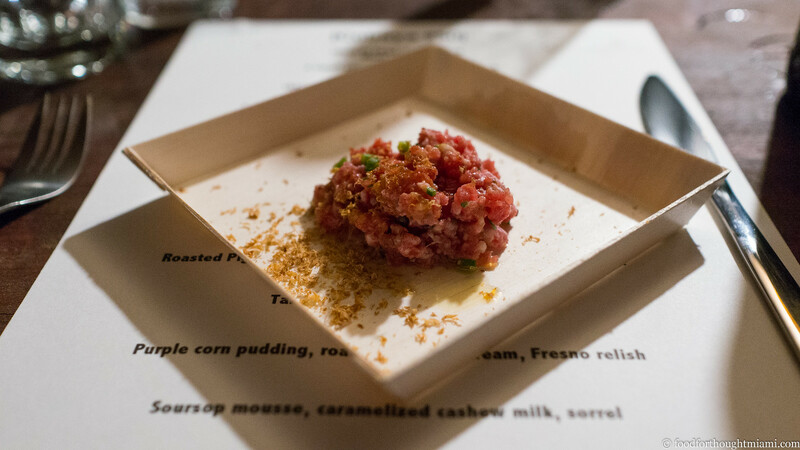 A "Surf and Turf" of sorts came next: a tartare of dry aged beef chuck, topped with shavings of "sea truffles" and a sprinkling of garlic chives. To bring the flavor of seared beef to the raw preparation, Alex seasoned with "beef salt" made by rendering ground beef trimmings and blending the caramelized beef bits with salt. This is so typical of his style, finding unique ways to build and enhance flavor. I only wished the beef had been a smidge less cold, as I think the flavors would have opened up even more. 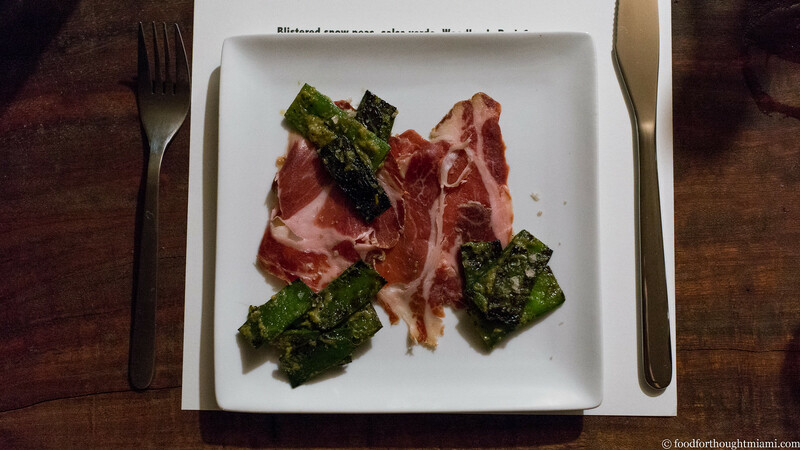 I honestly couldn't quite figure out why this combination was so good: blistered snow peas, blackened on their edges, and dressed with an oily, herbaceous salsa verde; plated with slices of silky pork coppa from Woodlands Pork in Louisville. Individually, all the components were good; together, they were great. I'm a big fan of the gelatinous, unctuous texture of beef tendon. And this was one of the best examples I've had: practically collapsing on itself, in a sticky braising liquid of coca cola and tamarind. Thin planks of slivered green papaya and a baton of luridly green celery provided a bright, crisp textural and flavor counterpoint. 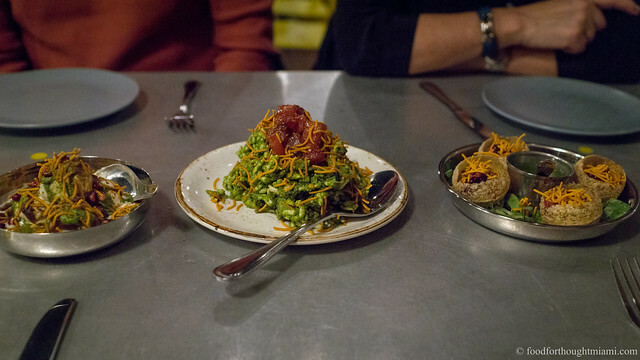 One of the great things about this dinner was that most of these dishes tasted like nothing I'd ever eaten before, sometimes in ways that were initially tough to wrap my head around. 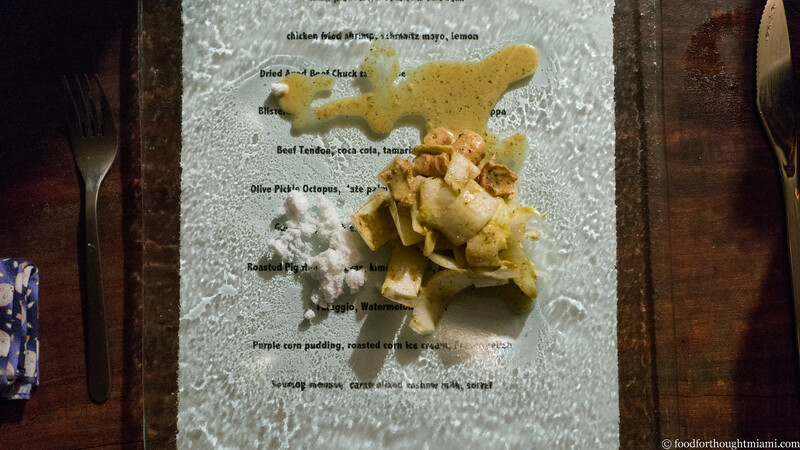 Like this combination of "olive pickle octopus," date palm, endive and powdered coconut. On one hand this had a tropical, Caribbean feel to it from the seafood, palm hearts and coconut. On the other hand, there was something that felt peculiarly Indian about the flavors, with that tangy, fermented twang of achar pickle. Another dish that was literally all over the map: gochuchang paccheri, combined with aged cheddar and Luchito n'duja. We've got Calabria with the paccheri and n'duja (a spicy, smoked, spreadable pork sausage), but somehow Korea got into the mix too with the gochuchang, maybe England with the cheese, and – wait – Luchito is a smoked chile paste from Mexico? 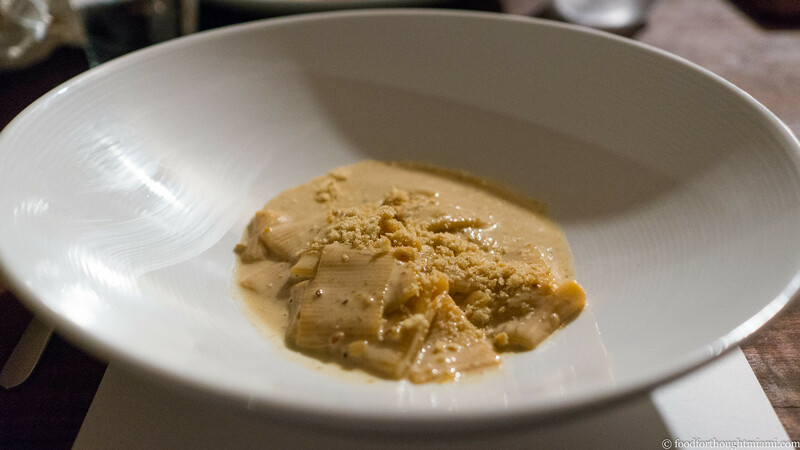 It just so happens that Ideas in Food consulted with the producers of Luchito, got the folks at New England Charcuterie to use it to spice the n'duja, and it wound up in a pasta dish along with some fermented Korean chile and soybean paste. Everyone got along perfectly. 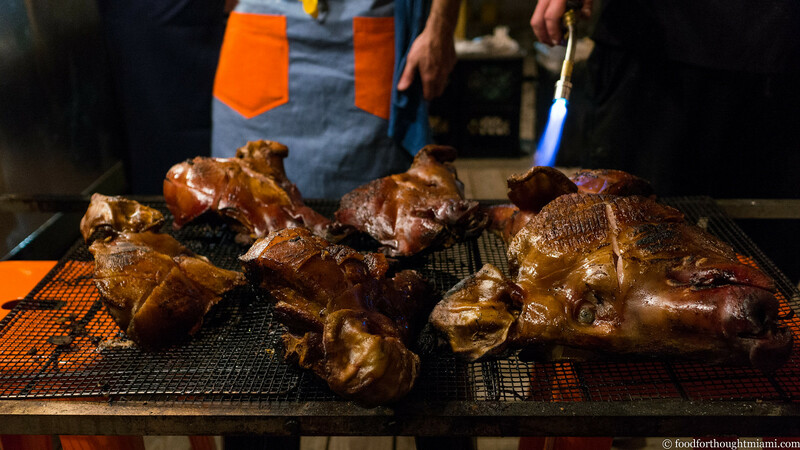 The centerpiece of the meal was a roasted pig's head – six of them, actually – served with pork-stuffed pupusas (made with "El Santana's Masa"), a kimchi curtido (another nice cross-cultural riff) and a pungently spicy chile sauce. 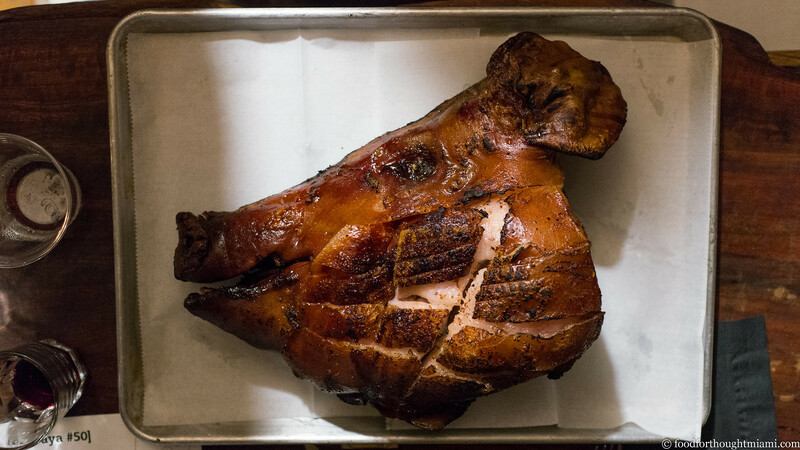 You learn a lot about people when you drop a big roasted pig's head in the middle of their dinner table. I was particularly impressed by the otherwise demure young woman sitting down the counter from me who demanded I carve out the eyeball for her (and then said I didn't get her enough of the connective tissue); and the table whose head was returned stripped entirely bare, as if it had been dipped in lye. I was happy to get most of the ear and a bit of the snout, and lots of crunchy, sticky skin. 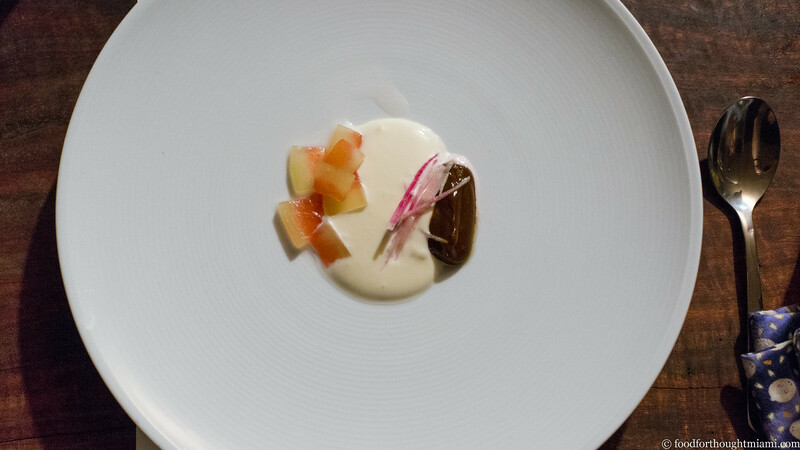 Funky, washed rind taleggio cheese was whipped into a gooey puddle, plated with pickled watermelon rind and julienned watermelon radishes. Tradition – a cheese course – untraditionally done. Desserts were prepared by pastry chef Ricardo Torres, who has a real knack for working with tropical fruits. 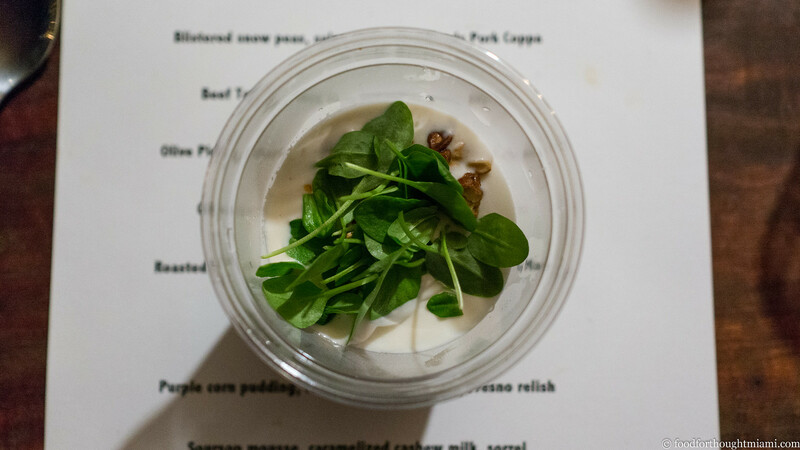 I loved his soursop (a/k/a the much more lyrical "guanabana") mousse, topped with sweet glazed cashews and caramelized cashew milk, with a pile of tart sorrel leaves for garnish. 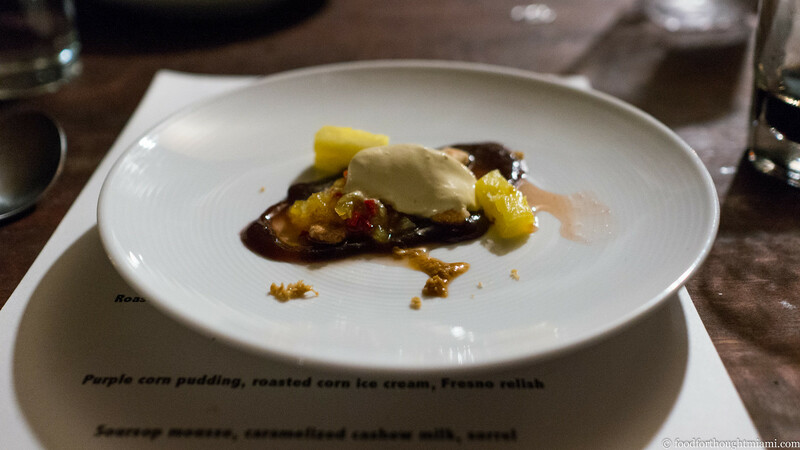 That was followed by a sort of riff on Mexican flavors: a purple corn pudding topped with a dollop of roasted corn ice cream, perked up by a tangy fresno chile relish and pineapple. A procession of petit fours is the traditional conclusion to many tasting menus. Some restaurants even give you a treat to take home on your way out: sea salt caramels at Manresa, a bag of granola at Eleven Madison Park, a little pastry at Atera. What does Jeremiah do? 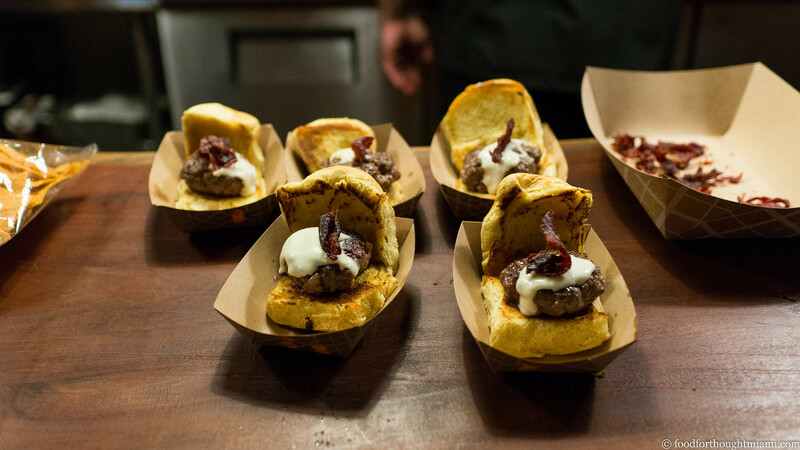 Makes dry aged burgers with melted taleggio cheese and bacon. That's how he rolls. It is still, frankly, astounding to me that we've done fifty of these. 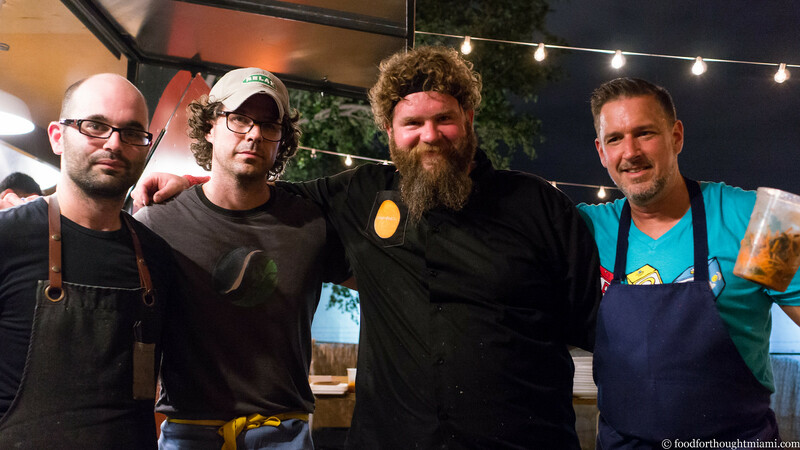 It wouldn't have happened without the contributions and efforts of a tremendous number of people: chefs like Jeremiah, Alex, Kurtis and Steve, and the dozens of other chefs who have contributed to our experiments; the service crews and managers who have graciously accommodated and taken care of us; and though I say it every time, I always mean it: most of all, the guinea pigs whose interest and support make these events possible. Thank you. 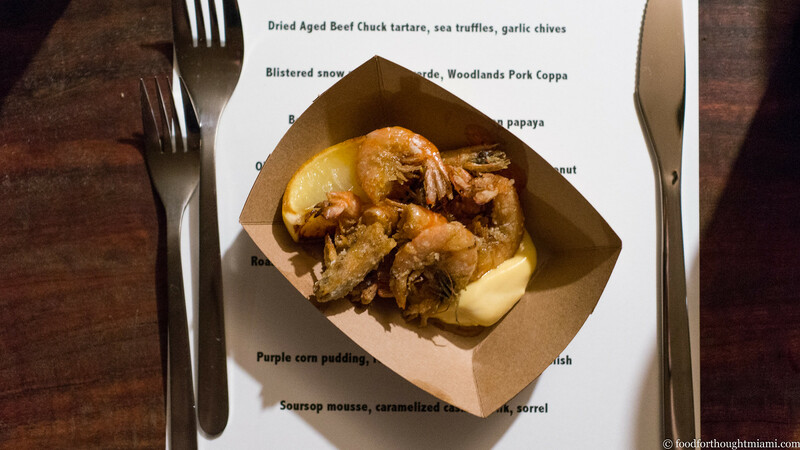 Years ago, Kurtis and I had somehow got to talking about pickled shrimp, and I told him that my mom had a great recipe – which he asked me to share. At a dinner he put on a couple months later, there was a shout-out on the menu to "Frod's Shrimp Dickles" (a "dickle," according to Kurtis, is a dill pickle). It was great to see it back again. Alex and Aki brine, them smoke, then dehydrate scallops, then grate into fine shavings with a Microplane for a smoky, oceanic, flavor-loaded garnish. 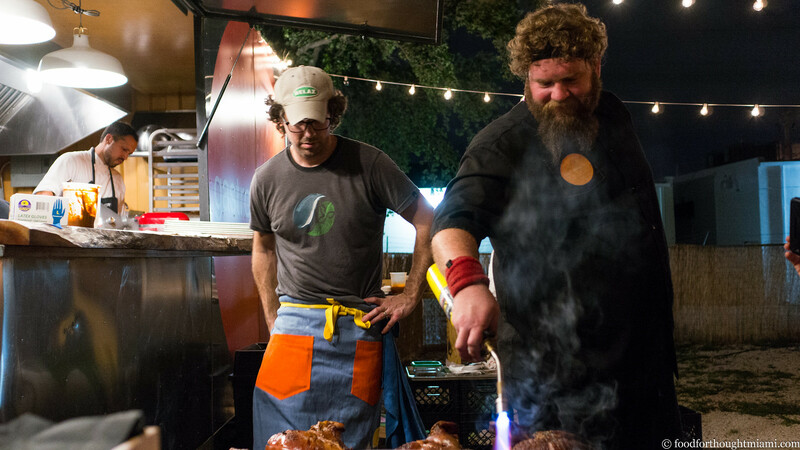 The link for Woodlands Pork looks to be dead, but the Facebook page for The Curehouse seems to be alive. You can read a bit more about Woodlands Park charcutier Jay Denham in this Starchefs profile. I regret not getting a picture of the accoutrements, being somewhat overwhelmed by the head. Happy 50th dinner! I remember those days at the Trump and miss going to these. Here's to many more guys!